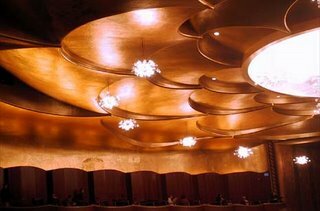 Tonight, I'll be floating near the gold ceiling of the Metropolitan Opera House to the soaring voices of Violetta Urmana and Olga Borodina when they sing Ponchielli's La Giocanda. Ponchielli, LA GIOCANDA, Met, 11.10.2006; de Billy; Urmana, Borodina, Mishura, Giordani, Lucic, Burchuladze. I'm curious to hear what you think of this one. I haven't seen it. And this is a very old production. Tonight is Les Troyens for me. My first. New production here (well, it premiered at Salzburg). It will be good to refresh my ears after all those Lucias, Salomes, and Mozarts (Idomeneo, Clemenza, and a three-hour concert), wonderful though they all were.